I never believed in Santa. When I was five, I didn't buy it. I'll lay that right out there. I can remember walking with my Dad, a spindly lad of five or six, down at the side of the stream near our home in Nairobi. It was a warm December, because it was Kenya, but Christmas was near. He told me Santa was coming soon, and asked me if I was excited. I shared with him that, well, c'mon, really? Did I look like I was three? How could there ever be a Santa? I mean, really, the technical and logistical elements were too dicey. As a teeny spud, I could still see how the grownup world worked, and there was no way this one guy could pull the whole thing off. Just. Wasn't. Gonna. Happen. Dad fessed up. He said it was a fun game grownups played so kids could get presents, like a magic trick. And could I please not spoil it for my brother? I said sure. That didn't bother me. As an adult Jesus-following pastor-type, I never did the Santa-thing with my boys when they were little. That's just a factor of my peculiar family arrangement. Raising Jewish children with a Jewish wife really renders Santa unnecessary, and Hannukah Harry? He just ain't the same. But that I never told them the Santa story when they were little doesn't mean it bothers me if you do. But Santa does seem to bother some people. Two sorts of people, actually. Santa really really bugs some atheists, and he really bothers ultraconservative fundamentalist Christians. The ultraconservative fundamentalists view Santa as a pagan accretion, and a recent one. Santa…the jolly old elf who pitches us Coca Cola and cigarettes...doesn't have a lick to do with Christian faith. Not a whit. In that, they're not wrong. Almost completely insane, but not wrong. The Santa we experience in our culture is a modern Western creation, an amalgam of various traditions, none of which have any grounding in the Bible. He also bears no resemblance to St. Nicolas, a notorious Turkish heretic-puncher who got his "patron saint of children" reputation in part because he was reputed to have resurrected dead kids. And not just any dead kids. Dead kids who'd been killed and pickled by a cannibalistic psychopath who was trying to sell their meat at the market. Not exactly 'Twas the Night Before Christmas, unless you're sitting around the hearth with Hannibal Lecter. Just what is that Roast Beast again? Long and short of it? Santa is not the historic St. Nicolas, any more than the fat gold prosperity Buddha you see at your neighborhood Chinese restaurant is the Buddha of the Noble Eightfold Path. And you know what? I don't care. Not at all. So he's not Christian. So what? Neither is a tree, or my dog. I refuse to get my knickers in a twist about it. Santa isn't a bad thing. There, of course, I find myself in disagreement with not just my glazed-eye fundy brothers and sisters, but also some of their conjoined twins in the atheist community. "Santa," for more aggressive atheists, is just another way that that ignorant theists teach our kids not to be rational. For them, it's an irrational lie, just like faith and believing that your dog loves you. Better to dispense with such ignorant and superstitious nonsense. Santa? How stupid. Just hand your five year old an illustrated version of the God Delusion and remind them that they're another day closer to the yawning blackness of mortal oblivion. A recent anti-Santa billboard pitched out there by an atheistic performance artist has been making the rounds lately on the web, one that accuses Santa of not just being a lie, but being a manifestation of capitalistic injustice inflicted on unwitting children by the Christmas-Industrial complex. 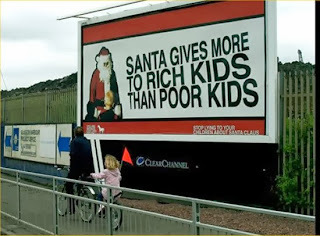 "Santa gives more to rich kids than poor kids," it frets. "Stop lying to your children!" it scowls, with the bright and hard moral certainty of a childless bolshevik. To such a cold sentiment and such an individual, I first find myself thinking that perhaps the most appropriate response is the one uttered by America's Favorite Gay Asian Uncle (™). I won't write it here for reasons of blog language policy, but you can follow the link if you'd like. But then I think better of it, and catch my breath, and simply think to myself, "And a Merry Christmas to you too!" Best to be positive, eh? Understood from outside of the sterile joylessness of any form of absolutism, Santa is a different thing. It's a game we play with our children, in which we delight in their simple wonder. And at the end of it all, when they finally realize what the Santa game is, of course we tell them what's really going on. And here's the blow that reveal delivers to them, the truth that shatters the "lie": Those who gave the gifts were the ones who loved you all along. Santa is like a magic trick, wonderful when you don't know the truth of it, and even more wonderful when you realize how it's done. For beings both warm-hearted and rational, that's enough to make it well worth while.